In Fundamentals of Music Production students are offered instruction in basics of Music Production, MIDI arrangement, and the basic elements of analog & digital recording. We use various tools such as Logic Pro X, Pro Tools, BEAT THANG VIRTUAL and, the Akai MPC to illustrate methods of beat making and song production. In this first of two sequential courses, students will learn about musical development in periods throughout history and its relevance to contemporary music styles and forms as well as the development of electronic and digital music technology in the twentieth century. 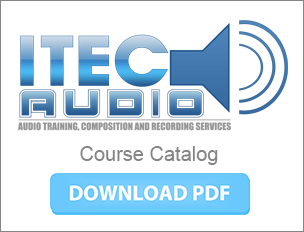 This course is designed to prepare students for Music and Audio Technology II in which their acquired musical and technological skills are applied to project-based learning in the digital workplace as replicated in our digital recording studio.